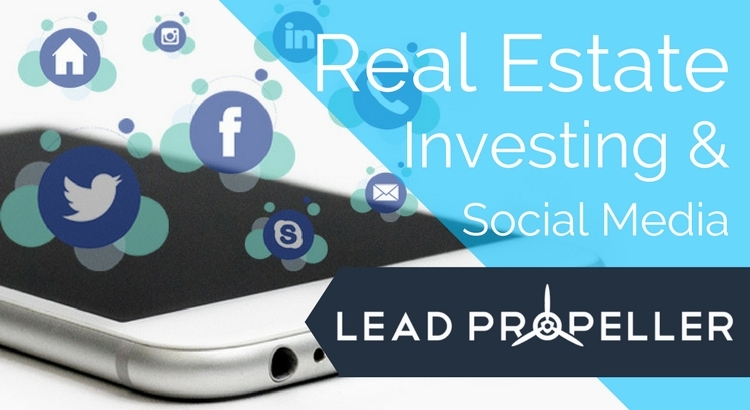 Real estate investing and social media sounds pretty self explanatory, right? You’re probably thinking, “Yeah I know, I’ve got a FaceBook, Twitter, Instagram, LinkedIn and all of that. So what?” It goes further than just having a profile, you need to be keeping up with it. We’ve been over social media marketing before in other blog posts, so we won’t focus so much on marketing in this article. Instead, we’re going to be looking at why your real estate investing business should be on social media, which platforms are the best for you, and how you can expand your business’s brand without even leaving your comfy desk! This is a less common question among many business owners in 2017 than it was in the early 2000’s when social media was just becoming a thing. Remember MySpace? Yeah, me either. That’s because it wasn’t aimed to help build businesses, it was just a platform to share ideas and communicate on. And that’s the point of social media: authenticity. The point of platforms like FaceBook, Instagram, Youtube, and Twitter (the big guys) is all about transparency and authenticity. To put it simply, having these platforms as part of your real estate investing and social media plan is to make you into a real person, not some money hungry corporation. Look at the steps you have to go through to just make a business page on FaceBook. The very first thing you’ll see is that you, the individual, needs to already have a FaceBook account and profile. Why? Because FaceBook is all about connecting people with people and sharing ideas. A business can’t do that, but the people who run the business can. Being on social media shouldn’t just be about marketing yourself and your business. You don’t want to flood your social media profiles and feeds only with the houses you’re trying to buy and sell. You should be posting all of your content, like we’ve talk about in our content marketing blog post. Your news feeds need to have your houses, yes, because that reaffirms your business’s purpose to your followers and potential customers. But think about it from their point of view. If they wanted to see your properties where would the best place for them to go be? Your website, not your Twitter. Which is why you don’t want to just be posting the houses that you have for sale. You need to be showing more of what makes your business stand out from the others, but on a personal level. Remember, it’s all about being as authentic as possible. Don’t worry, we’ll be going over the strategy for this further down in the article. So with understanding that social media is about being as authentic as possible, what is the best way to build your real estate investing business’s brand? Let’s focus on that last bit. A brand is what sets us apart from our competition. You want to show yourself as someone who is involved in real estate investing. This presents your business as one that is part of the discussion other investors are having. You wouldn’t want to go to a doctor who hasn’t practiced up to date medicine. So then why would motivated sellers, or other investors for that matter, want to buy or sell houses to you if you’re not an up to date real estate investor? Being a part of the conversation shows others that you know what you’re doing, and gives them the confidence to trust you with business transactions. By making and sharing posts that are worth the time of your follows is more important than shoving your service and properties down their throats. Having content posted that adds to their understanding of your business, and what you can offer them, shows that you have confidence in your skills and that they should too. Remember, though, when you’re posting these pieces of content that aren’t strictly sales, you need to always keep your target audience in mind. You always want to be circulating content on your social media profiles that adds to your target audience’s overall experience with your business, and that contributes to the conversations that they’re already having. It needs to be said that your strategy will have to vary depending on who you’re targeting. Real estate investing and social media trends need to be specific to the consumer of your content. For example, a motivated seller doesn’t have the same concerns as a wholesaler. Just like it wouldn’t make sense to post an article about REIA meetings to your buying site, it doesn’t make sense to post a link to that same article on your business’s Twitter if you focus on house flipping. Social media is more than just content sharing and being authentic. It’s also the largest form of mass networking to date. That’s why it’s also commonly referred to as “Social Networking”, because that’s what it’s meant for. Connecting to other like minded people, entrepreneurs, and customers with your real estate investing service is why you need to have a strong social media strategy. Each post should go back to this one thought: how is this helping to build my community? After all, if people don’t know about your services, how will they be able to buy and sell your houses? They won’t. So it’s your job on social media to build a community on your pages. It is important that your followers are genuine followers, not just the lowest common denominator. Expanding real estate investing and social media are very similar. You don’t want to waste money marketing your business to people who aren’t interested in selling their house any time soon, just like you don’t want to get a follower who isn’t actually interested in what your profile is offering. You need followers to be trusting and motivated, just like you want sellers to be trusting and motivated. The point of social media is to communicate with one another. That’s why it’s important that you let your community of other investors, motivated sellers, and potential future customers, know that you’re engaging with them the way you want them to engage with you. That is all done by the three bullets above. What Platforms are Best for Real Estate Investing and Social Media? Glad you asked! Joking. But really, it is important to know the different platforms. More importantly, it’s important to know which platforms will be best for real estate investing and social media, instead of just what platforms are good for social media. The big guys we already talked about are the obvious ones: FaceBook, Twitter, Instagram, and YouTube. Of course you should be on these. The issue that will come up is trying to find your niche within the sea of people who are using those platforms. The big 4 are the Big Four because everyone is using them – everyone. People have FaceBook accounts for their dogs. Their dogs! So knowing how to make your real estate investing business’s page stand out to your audience will take a lot of SEO on that page. After all, a dog can’t buy a property from you. We have already gone over what your posting strategy for the big 4 should be in other blog posts, so we won’t waste time with that here. Instead, we’ll talk about how to optimize your big 4 profiles. And we’ll talk about real estate investor exclusive platforms, too! FaceBook and Twitter have group functions that you should definitely be taking advantage of. Groups are a way to specify who is exposed to your profile, and a way to better network with people in your target audience that you haven’t engaged with yet. Keyword being “yet”. You can make groups for your business by going to your “group” tab on the left side menu, or you can join other already existing groups. I highly recommend BOTH. By creating your own group, you’re giving your community a place to come together under your business’s umbrella. Creating a sense of community and involvement is exactly how you keep them interested and loyal (and all of those awesome things we talked about just now). Which will only help to convert them into customers later. Authenticity builds reputation which builds trust. By becoming a member in an already existing group – like the LeadPropeller VIP page, for example – you are creating another avenue for your real estate investing business to networking online. That’s the point of having and being a part of groups on FaceBook and Twitter. You’re directly interacting with your target audience every time you post. Now go be social and get your properties and business seen! For YouTube, you want to specify with the playlists. If you take a look at the Flipping Junkie Channel, you can see all of the different playlists that have been created. This is to keep your audience watching your content that all ultimately leads them back to your website. In a playlist, your videos play one after the other without your viewers needing to click any more buttons. Great! Now they’re watching all of your stuff automatically, and seeing what a great service your real estate investing business provides! Duh. You should have the same video testimonials from your website on your YouTube channel, AND those videos should be in their own playlist. That way, if a motivated seller looks your business up, they’ll see all of your amazing success stories all in one place, playing one right after the other! Always! Show what you’ve done the the properties that you’re putting on the market. Let your customers know the great work you’ve done, and why they should be interested in your houses. This is a great way to not only attract casual buyers, but other real estate investors. If you think they’re not watching property walkthroughs on YouTube, you’re dead wrong. Just like the property walkthroughs, you need to have before and after videos to show exactly what you’ve changed and how dramatic your impression on the house has been. You want to build a reputation as a good investor, so you should be showing that you know what you’re doing! Our friends over at Bigger Pockets have made real estate investing and social media a dream. If you don’t have a Bigger Pockets profile, you need to get one. It’s the best place for real estate investors to network online, because it’s exclusive to real estate investors. It’s not like Zillow or Trulia where it’s for anyone involved with real estate – it’s investor exclusive. Remember all of the important stuff we covered about groups to specify your audience on FaceBook and the other big 4 social medias? Bigger Pockets takes care of that for you by having easy to access discussion boards of other investors. The more you build your profile and specify your area, the more useful everything becomes. And, no, we’re not getting paid to say this. You will seriously save yourself lots of time for both your real estate investing and social media plans by just having a Bigger Pockets profile! Get network, that’s what it’s there for! You can always hire a content marketing person to take care of your social media for you, but that’s expensive. You could also get an intern who knows the ins and outs of social media. Or, you could ignore social media all together (we DO NOT recommend doing that). We understand that social media is one of the things that will often get pushed to the back burner when you’re consumed in your real estate investing business. You have a million other things to worry about. You have to be the boss, the foreman, the marketer, the HR, the PR, the legal – everything. So let us make your marketing easier. Let’s face it, social media is the easy part of online marketing. Share some pictures, post where you need to post. Simple. But, there’s more to marketing than just FaceBook and YouTube. You need an SEO plan, and a PPC plan. Let us take care of those fore you, so your real estate investing and social media will be all you need to worry about.